Homemade cards are not only a joy to create but they are also super special for the recipient to open up. If you are looking for a gorgeous homemade card to make for someone special this Valentine’s Day or Mothers Day, you are in luck! 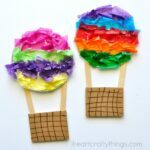 This 3D Hot Air Balloon Card is colorful, sweet and unbelievably easy to create. In this post, learn how to make this gorgeous 3D Hot Air Balloon Card with our helpful template, step-by-step tutorial and video. 2. 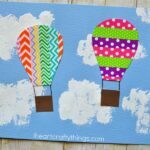 Cut out each of the pieces of the hot air balloon card template. 3. Fold your hot air balloon basket in half along the dotted line on the template. 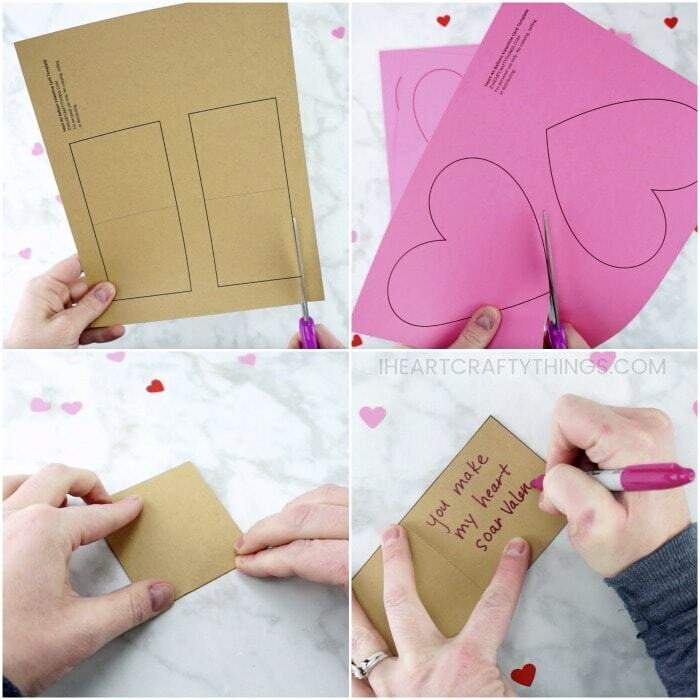 Use a marker to write a special message on the inside of the card. You can use something like “Love is in the air”, “You make my heart soar, Valentine!” or come up with a clever saying on your own. 4. Gather your paper hearts. Fold five of the hearts in half. 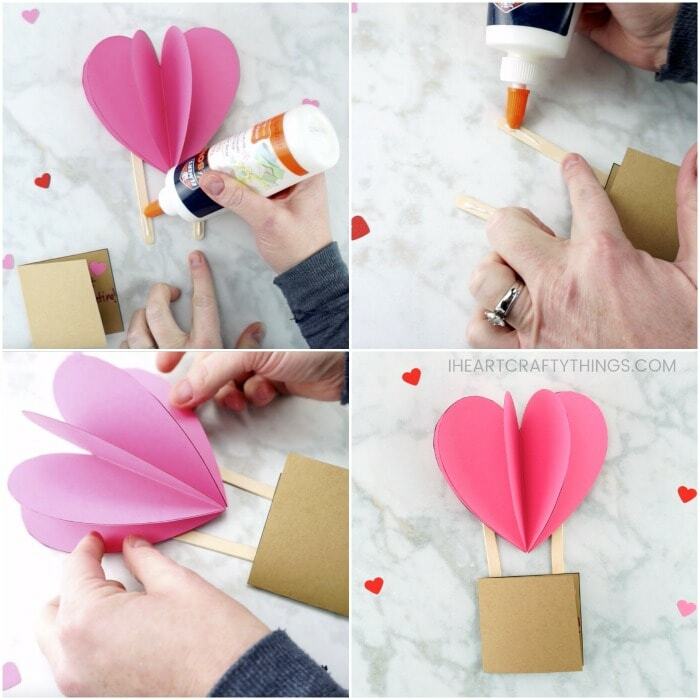 Use your glue stick to add glue to one of the folded heart halves. Then glue another heart half onto it. 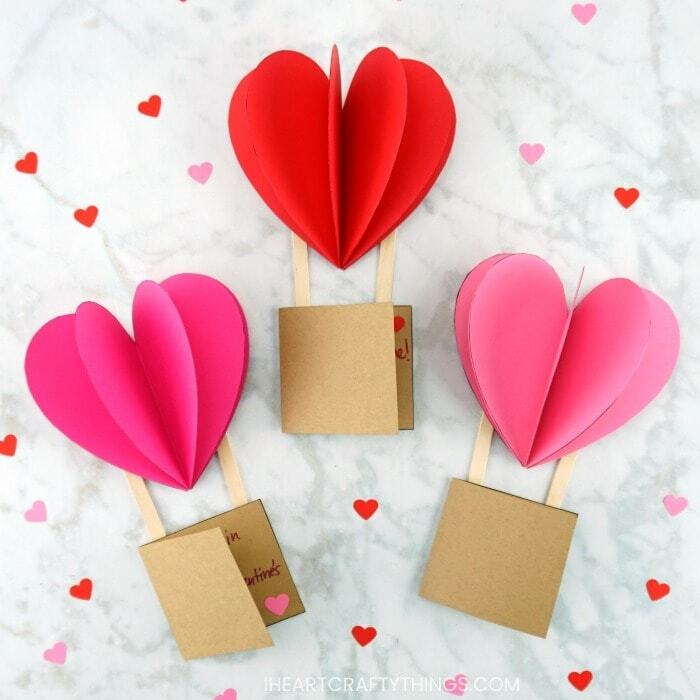 Continue adding glue and adding a paper heart until all five have been glued together, creating a 3D heart air balloon. 5. 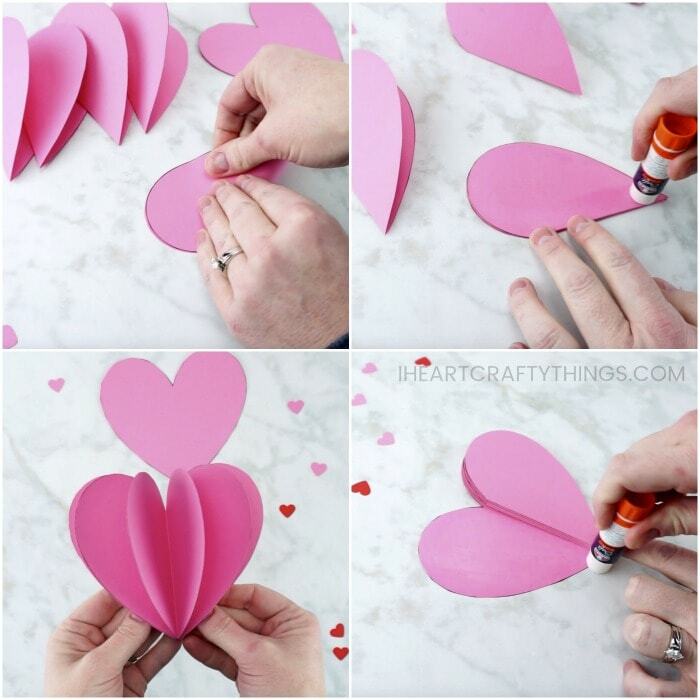 Add glue to one of the outside halves of the 3D heart and glue it onto the reserved paper heart. Then add glue on the opposite heart half and glue it down onto the other side of the paper heart. 6. Grab your two craft sticks. Add Tacky Glue at the bottom 1-inch of each of the craft sticks. 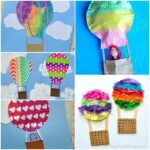 Glue the hot air balloon basket card onto the craft sticks. 7. Add Tacky Glue at the top 1-inch of each of the craft sticks. 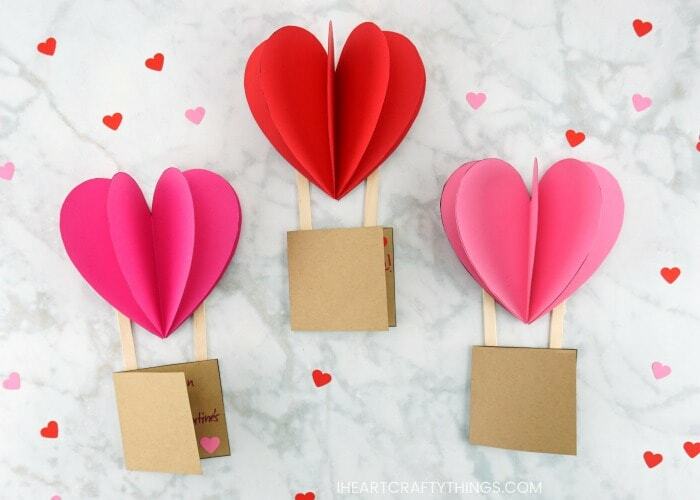 Glue the 3D heart air balloon onto the top of the craft sticks. Let the Tacky Glue dry completely. If you are on a time crunch and don’t want to wait for drying time (boy, can I relate!) 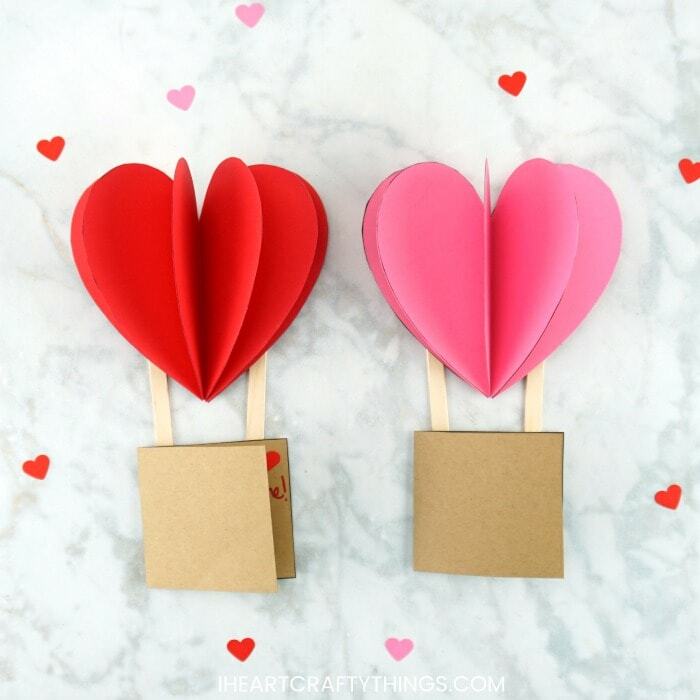 you might try using Glue Dots or double-sided tape to attach the heart air balloon and basket to the craft sticks. We haven’t had a chance to try those options out so I can’t speak for their durability, but it seems like they would both work. Once your glue has dried completely, you can pick up your hot air balloon card to see it’s gorgeous 3D dimension. From both the top, bottom and all sides of the balloon, it is absolutely beautiful. The 3D effect on this card makes it so you can’t place it inside an envelope to mail, but I think the recipient will love it just handed to them. 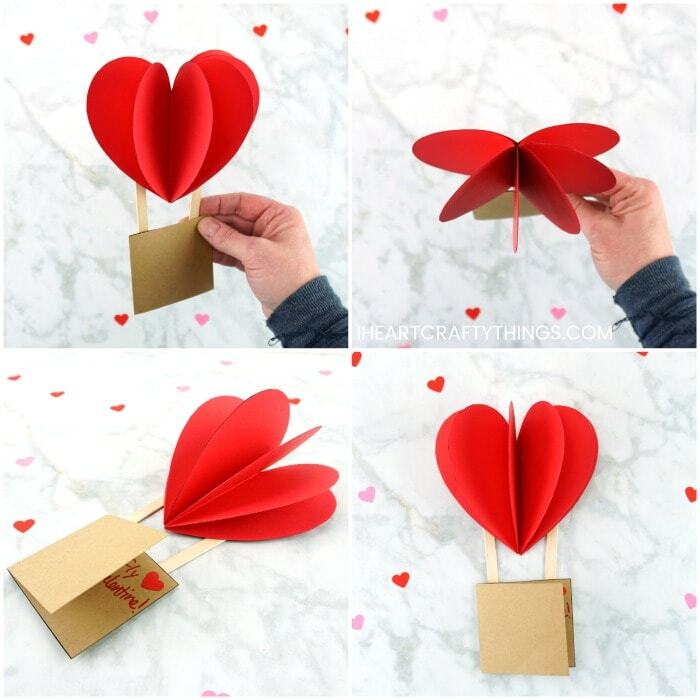 This gorgeous 3D Hot Air Balloon Card makes a perfect Valentine Card for kids to give to Mom, Dad or grandparents. 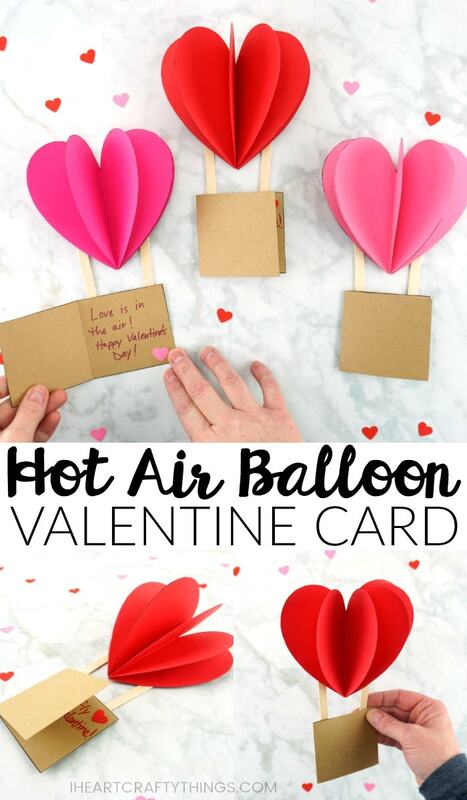 The card is a little too advanced for smaller children but it would make a fabulous Valentine’s Day craft for kids in Elementary School to create at school as a take home craft. 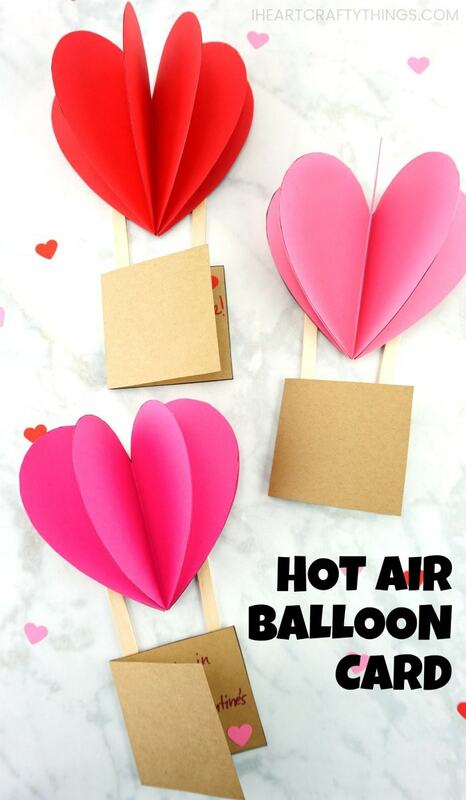 You can also create this beautiful heart balloon card for a special Mother’s Day card. Mom or Grandma are sure to smile from ear to ear when they receive this gorgeous card. Watch the video below to be guided through each step of this 3D Hot Air Balloon Card. You can view more easy kids craft tutorials on our Facebook page, or right here on our website. The little heart prickles on this cactus Valentine card make it oh so sweet! We have a free template for this card too, making prep time easy, peasy. Looking for a beary cute card for Valentine’s Day or Mother’s Day? This adorable bear card is perfect! We have both a color and black and white template available for kids to color on their own. While not a traditional card, this handprint heart tree craft would make a fabulous gift for Valentine’s Day to anyone special. Eager to try this craft!